Jim McCann originally nominated the Glen Golf Club as a gem back in 2005. Since then the course has made our Scottish Top 100 rankings which we published in 2009. The following passage is an extract of Jim’s original article from 2005. I have lost count of the number of times that I have played at a club that lives in the shadow of a nearby ‘must-play’ course and come away thinking ‘what a golf course that is.’ The Glen Golf Club in North Berwick is a prime example. The west course at North Berwick, just a couple of long drives away, gets all the plaudits in this neck of the woods but the east links of The Glen deserves recognition as a cracking alternative venue. Because most of the course is played on a cliff top, the views across the Firth of Forth to Bass rock and the island of Fidra, then beyond to the Kingdom of Fife, are a magnificent backdrop to the terrain over which the 18 holes are laid out. Nine of the twelve par four holes are less than 400 yards so the layout will not tax you for length. Rough off the fairway is often long, wispy grass so you can cut loose with your driver off most tee boxes. Greens are not overly undulating or raised with run offs to throw slightly miss-hit shots away from the pin. There is a holiday feel to playing here with so many people nearby relaxing along the beaches or walking along the hill paths. The signature par three 13th hole ‘Sea Hole’ which hugs the coast may be the one most advertised by the club but what a driving hole awaits a few holes later at the last when the elevation drops a hundred feet or more at ‘Jacob’s Ladder’ down to the green by the clubhouse – a thrilling, exhilarating way to end a great round of golf. North Berwick is a very pleasant seashore village that served as our base during our first golf trip to Scotland last year. North Berwick has two beautiful golf courses on each side of the town. The West Links is the better known golf course and attracts most golf tourists visiting North Berwick. On the other side of the town the East Links is situated, better known as the Glen. It offers a true and honest golf experience. The Glen also has a departure and return in front of the clubhouse, but since part of the course is situated on a raised plateau, the Glen also offers magnificent views over North Berwick, Bass Rock, the Law and the Firth of Fife. On a good day one can see the Forth bridge of Edinburgh. The Glen - not being excessively long - offers a nice variety of good golf holes, and excellent greens to test one's putting skills. The Glen has been there quiet some while, and one can feel the maturity of the golf course when playing it. Where the West Links is normally totally jammed from dawn till dusk, Glen offers a quiet and pleasant golf experience. We discovered the Glen last year during our trip, and we returned this year, enjoying the course as much as last year! Overlooking the town of North Berwick the cliff-top course enjoys simply sensational views across the Firth of Forth; as good as you’ll find on any golf course. The coastal layout provides an enjoyable test but doesn’t quite stand shoulder-to-shoulder with some of the more recognised links in this part of Scotland; not that it pretends or tries to. The turf isn’t quite as good and the green complexes don’t hold as much interest as the real top drawer courses but that’s not to say a visit here isn’t warranted because it is. The Glen promises much but for me ultimately just fails to deliver, but only if you are expecting the very high standard which many other courses deliver in East Lothian. This isn't really a negative on the course, more just a nod to the extremely good and tough competition East Lothian provides. That said, go to The Glen with modest expectations, get a beautiful day, simply enjoy the walk and I suspect there are few better places to be. 10 of us played The Glen on a lovely sunny day with the Firth an eery, glassy calm. Lots of skylark and oystercatcher calls on the breeze and great views to Bass Rock, Tantallon Castle at the turn and over to Fife. Unlike some courses of this age, other than the quirky Sea Hole par 3 the par 3 holes are long and testing even in quite still conditions - a 3 wood, a 3 iron and an uphill 5 iron. We got round in 3.5 hours on a sunny Sunday morning with several local courses closed for qualifying, which was very impressive with some up and down terrain and lots of walkers. Everyone at all handicap levels enjoyed the course as a Society venue and would recommend it and would be happy to return. A very friendly club with a popular Sunday carvery in full swing when we finished; highly recommended for an enjoyable game of golf for all. The lack of a proper warm-up area (ie: at least 200 yards in length)is something I always find off-putting and signals a course that can't be for really serious golf; nevertheless I did want to play the Glen to notch-up a round at every course in the Lothians and this I did. For me it's a 3-ball 'mark' that it gets. It's clearly in the shadow of North Berwick Links in much the same way as say Nairn Dunbar is to Nairn Championship for example. The condition when I played in July 2015 was good however but there are too many unforgettable holes to merit the course anything more than 3 balls/stars. I'm sure the members are proud of it but much like the course at nearby Whitekirk I do wonder why visitors would pick it (other than for my own reasons stated earlier). East Lothian is well-stocked with the likes of the Open qualifier courses, Dunbar and North Berwick, which are strong 5-ballers as well as Luffness New and Gullane 1 or Gullane 2 rated similarly then Muirfield as a 6-baller.Glen suffers from being caught somewhere in the 2nd division of courses in East Lothian; that's not to say they're not pleasant places to play but when faced with the riches of those mentioned above I'd once more question why anyone could possibly state their review to be a 5-ball/star or even a 4. Sorry, but the bias of local members mustn't overshadow the real merit of a course. Played here on a recent trip up from London to North Berwick with friends. Very welcoming pro in the shop & friendly members out on the course.A cliff top course with fantastic views from just about every hole & lots of fun to play ( We ended up coming back the next day for another round)Defiantly put it on your list if you’re in the area. Played this course in april 2009 and found it already in good condition. Perfect course for all handicaps and why play a course nearby for 100 pounds if you cn play this one for less than 25. Beautiful views! Having first played this course 11 years ago on a tour of Lothian I remembered the course as a nice play to play golf but nothing else. However having now moved to the area and having played the course twice this summer I cannot recommend this course enough. Sure it is not one the 'great' clubs but the clubhouse and course have had significant upgrades in recent years and both are now well above average in my view. The course is consistantly interesting and in good condition and compared to many of it neighbours is good value. I cannot understand any negative comments about this course. This is an absurd rating. The test must be whether you would rather play the Glen than almost any of the other courses rated lower. eg Gleneagles (King's and Queen's) Blairgowrie (Rosemount and Landsdowne) Western Gailes etc. Many of the holes are featureless and on the side of a hill. There are good holes but these cannot make up for the mediocrity of the majotity. The condition is no more than average. I appreciate that probably no one has played all 100 courses but I have played on 82 of the list and I would rate the Glen 83rd! I made an error in mistaking the ranking based on reviews. However my remarks are just as valid relating to the ranking of 68th!! Read all the other reviews and you will see you are in the minority, by far, this course is an absolute joy to play and in outstanding condition. what is your grudge against it ?? There are no greens whatever 'on the side of a hill'. You must have reviewed the wrong course. Our fourball had an absolute blast today on the Glen course. It's not the most challenging, I agree, but that's not why we came here anyway. We were looking for holiday golf (played on greens that were an absolute joy to putt on) on a day that was forecast to be sunny and both the course and the weather delivered big time. The views across the Firth of Forth are a wee tonic in themselves and if the excellent conditon of the course, coupled with the wonderful surroundings don't stir your blood then it's probably time you packed away the golf sticks and took up lawn bowling. The Glen offers exceptional value for money, especially when using discounted green fee vouchers as our group were, and I'm absolutely delighted that the course has made the Tartan Top 100 on this site as it thoroughly deserves such recognition. I played the course on a calm sunny November day last year for the reduced midweek rate of £20 and found this to be good value, particularly when considering that there was not a winter green or mat in sight. The new clubhouse looks impressive and contained excellent changing facilities. The first hole starts off at ground level then the approach shot must be played up a steep incline; after putting out on the first it is from this lofty cliff-top level that the next 16 holes are played from. Personal favourites on the front nine included the bumpy downhill par 4 third and the two-shot dogleg eight hole where the views from the tee box down to the bay and crashing waves were simply breathtaking. The back nine starts like the first nine with an uphill par four. This leads up to the best stretch of holes on the course beginning from the 448 yard par 4 12th where you must drive from an elevated tee and then hit an accurate tee shot to a smallish green at the far end of the course. Next up is the famous, and much photographed, 13th called Sea Hole. Again the tee is elevated from the green and there is a potential for a blind tee shot depending on the pin placement. When I played I could just see the top of the flag but despite this advantage my ball still landed on the beach area adjacent to the green! The 14th requires another uphill drive as the hole begins by hugging the edge of the cliff and the approach must be hit towards the green which ventures back inland from the cliff edge. The long par 4 15th and the solid 186 yard slightly uphill par 3 16th concludes this fine run of holes. The 17th also runs along the edge of the cliffs before leading the player back to the top of the hill where they would have putted out a few hours earlier on the first hole. 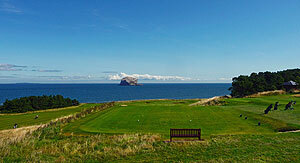 From the vantage point of the 18th tee box the golfer stands high above the fairway, looking down to the pro shop, clubhouse and the town of North Berwick and off into the distance sits the imposing bass rock out at sea. A slice from this high position could potentially end up over the road and into the sea, however it is possible to hit a long drive towards the green due to teeing off from such high altitude and this should leave a mid to short iron into the well guarded final green.